A 2017 Ground-penetrating radar (GPR) survey discovered the line of Z-stones to have been one side of a former square feature, built around the remains of a Neolithic house. When Avebury's southern inner ring was complete it would have been highly reflective to sound, producing clear echoes from any sounds made within it. What would this have sounded like? The Ring of Brodgar, on Orkney, has a diameter of 104 m - exactly the same size as Avebury's southern inner ring. 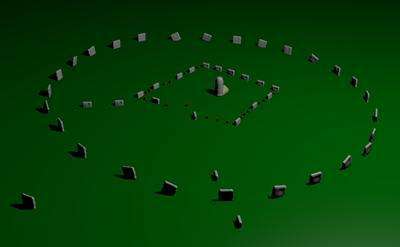 Avebury's southern inner ring originally had around 30 stones but the exact number is not certain.